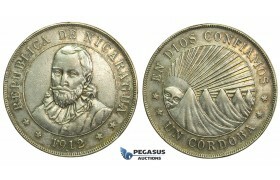 L09, Nicaragua, 1 Cordoba 1912-H, Silver, Toned High Grade! L09, Nicaragua, 1 Cordoba 1912-H, Silver, Toned High Grade! (Minor bag marks) ..